The historical form of humanitarian relief is to provide people in need with goods, however, assistance in the form of physical goods is shifting towards providing cash-based assistance instead of goods (Kovács, Humanitarian logistics: meeting the challenge of preparing for and responding to disasters, pp 275–285, 2014; Heaslip, J Humanit Logist Supply Chain Manag 5(1):2–11, 2015). Cash-based assistance is a new concept, and growing rapidly. While only US$2 million in the form of cash-based assistance was provided as international humanitarian assistance in 2006, the sum increased to US$47.4 million in 2011 (Global Humanitarian Initiative, http://www.globalhumanitarianassistance.org/wp-content/uploads/2012/07/GHA_Report_2012-Websingle.pdf, 2012). Cash-based responses (also known as cash transfer programmes, CTP) are mechanisms to provide resources to a population in two main ways—by providing them directly with cash or by giving them vouchers. Cash and voucher programmes are considered to be a more cost effective solution than the more common in-kind provision of goods and services to beneficiaries and households. A key advantage is that unlike in-kind aid, cash allows households flexibility in deciding their spending needs. Cash can help generate local market activity and restart livelihoods. It is often a more empowering and dignified form of support. However, there is a reluctance to deliver cash transfers. Cash is said to be susceptible to theft, corruption and misuse. It is prone to targeting errors. It can cause inflation and distort local markets. Nevertheless, practitioners are finding solutions to mitigate these risks and have observed that many of the risks also apply to in-kind aid (Creti and Jaspars, Cash-transfer programming in emergencies, 2006). 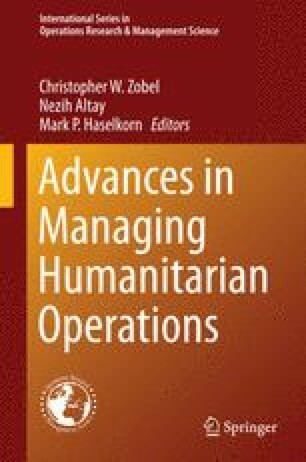 This chapter aims to develop an understanding of cash transfer programmes that will help reduce their risks to humanitarian operations.